To date, just under one-third of accountable care organizations (ACOs) have been eligible to share in savings. This situation is changing somewhat as ACOs gain experience in managing populations of patients for high quality and low cost healthcare. As of 2016, nearly 50 percent of Medicare lives were covered in non-traditional arrangements, including Medicare Advantage and Medicare ACOs. An estimated 9 million of the total 56 million Medicare lives (16%) are in an ACO. Ninety-two percent of the 473 Medicare ACOs registered in 2016 are participating in the Medicare Shared Savings Program (MSSP), with the vast majority participating in the non-risk bearing arrangement known as “Track 1”. 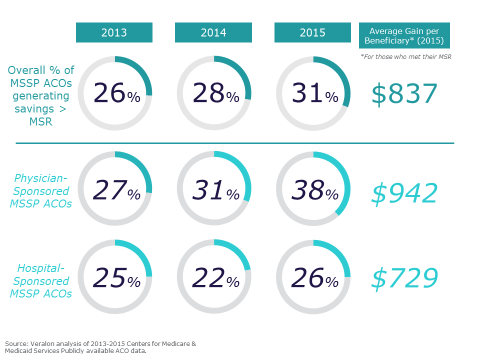 As in 2013 and 2014, the majority of MSSP ACOs in 2015 failed to share in savings; however, performance is improving somewhat. Although over half of MSSP ACOs (52%) spent less than their benchmark, only 31% of MSSP ACOs were able to reduce costs enough to receive a share of those savings from CMS. Many healthcare leaders question whether hospitals or physicians are best situated to improve healthcare quality and efficiency. Hospitals (with their physicians) typically invest in more infrastructure, while physician networks typically invest more frugally and may be better able to engage their peers. For the third year in a row, MSSP ACOs formed by physician groups outperformed MSSP hospital-sponsored ACOs, with 38% of physician-sponsored ACOs generating enough savings to share in savings, compared with 26% of hospital-sponsored ACOs. The amount of savings achieved by physician-sponsored ACOs was greater as well; on average, $942 per beneficiary was generated by physician-sponsored ACOs compared to $742 for hospital-sponsored ACOs. Statistically, the gap in performance between these two types of ACOs has become more significant over the years. In 2013, there was no significant difference between the two in the likelihood of sharing savings, but by 2015, the difference was statistically significant at a 99% confidence level. While this would seem to suggest physician ACOs are getting more familiar and successful with managing costs and quality each year, that may not be quite what is going on. Rather, there are more “young” hospital-sponsored ACOs than physician-sponsored ACOs; hospitals are realizing that they have to start down the path toward value, and 60% of all MSSP ACOs in 2015 (compared with only 40% in both 2013 and 2014) are hospital-sponsored. So it is possible that the physician-sponsored ACOs are performing better due to greater experience. Results from 2015 strongly suggest that more years of experience in managing population health contributes to greater success. Of the 120 MSSP ACOs that shared in 2015 savings, 101 (84%) have been in the program for more than a year. It is possible, of course, that less successful ACOs dropped out of the program. Despite mixed performance and the historical preference for Track 1 (non-risk) ACOs, there is a chance that we will see a shift in ACO participation towards MSSP risk-based models such as Track 2, 3, and Next Generation ACOs. These ACO tracks qualify as Advanced Alternative Payment Models (APMs). Advanced APMs avoid the MIPS reward and penalty system, and provide some access to a 5% lump sum bonus. For an explanation of ACO strategies for MACRA see our Veralon View from September 2016.